Compost, as a result of processing waste and organic waste, a big benefit for the effort to improve soil structure by increasing organic matter content ( C-Organic) and will increase the ability to maintain soil water content. Microbial activity are beneficial for crops will increase with the addition of compost. Microbial activity helps plants to absorb nutrients from the soil. Microbial activity are also known to help plants deal with disease. Plants are fertilized with compost also tend to be better quality than the intake of plants with chemical fertilizers, eg more resistant crops stored, heavier, fresher, more spirited and more comfortable. High organic matter content in compost is very important to improve soil conditions. Based on the known two roles ie, soil-compost and soil conditioner ameliorator. Soil condotioner namely the role of compost in improving soil structure, especially the dry soil, while soil ameliorator function in improving the cation exchange capacity in soil. A good compost for use as growing media perfect when it has experienced weathering, characterized by discoloration of constituent materials ( a black-brown) , odorless, has a low water content, and has a temperature equal to the space. While the laboratory has a C / N ratio. Agricultural land is cultivated entirely by composting organic materials, will produce healthy organic food to humans. The advantages of organic foods including ( 1) . have a better nutrient content. Organic foods have an average content of vitamin C, minerals, and phytonutrients ( substances in plants that can fight cancer) is higher than conventional foods, ( 2) . Organic food is more durable not easy to talk and ( 3) . save on production processes and reduce the level of environmental damage. Organic food is healthier then be trusted and can give hope to the consumer to be able to live healthier, longer life and free from disease. Forms of organic food is currently processed into a variety of forms ranging from its original form ( fresh) or in forms that have been processed with modern machinery into powder soluble in water. 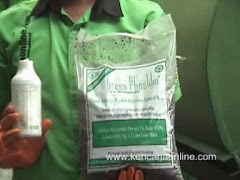 To overcome the problem of fertilizer efficiency and environmental degradation is one of the movement, re-use of organic fertilizer ( like compost) which originate from natural and local resources. Use of compost can substitute the use of chemical fertilizers that can increase land productivity by practicing environmentally friendly organic farming. In addition to the use of compost can also reduce fluctuations in temperature and humidity increasing land due to climate change. To produce good quality compost, composting technology is needed that has been well tested in laboratory and field. Realizing that in the future, chemical fertilizers ( inorganic) - as a non-renewable natural materials ( unrenewable) will be increasingly reduced availability, as well as, on the other hand, there is a health awareness of the importance of natural food ( organic) - since 2004, CVSK develop fertilizer technology biological and organic as well as to develop all equipment manufacturing waste and organic waste into compost. Various machine tool capacity sewage treatment and waste composter include manual ( type S, M, L) , electric composter household scale ( TO 100L) , machine tool and the enumerator organic composter large capacity in the form of Rotary Kiln. For purposes of this big scale, available on the machine tool selection Rotary Klin capacity of 1 m3 ( 1 / 3 Ton) / unit / 5 days, 3 m3 equivalent to 1 ton / unit / 5 days to 6 m3 ( 2 Ton) / units / 5 days. With the machine tool if the garbage Biophosko® make more modern, fast and hygienic. This technology changed the processing of garbage and waste in order to composting ( composting) of origin using the technique of open plot ( open windrows) so that the land requires at least ( 1, 5 x 6) m2, should be reversed every 1 week for 1 month or more, must be closed sheeting, shall be awarded various starter materials ( dust, ash, waste saws, etc.) - which is very hard to find in the city, is now very easy. Assistance of appropriate technologies among others: ( a) . 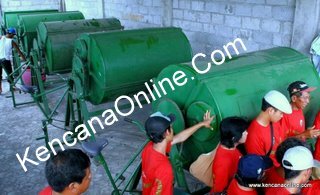 accelerate the composting time ( decomposition of organic matter) from 60 days to 5 days, ( b) . A simple and practical labor operators only need 1 person / unit though Installation Kaps 3 m3 / day, ( c) . 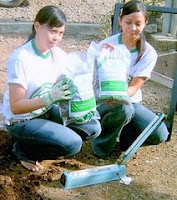 produce liquid organic fertilizer ( POC) - which in the plot technique so often wasted material contaminants seep into the ground, ( d) . purposes of the land area is much reduced compared to traditional techniques, and ( e) . hygienic, does not cause noise pollution and bad smell and odor*).